Bishop John Roundhill visits our Parish! We are so very pleased to announce that our Bishop John Roundhill will be visiting our Parish on Sunday November 10th. He will be preaching and celebrating with us all. Please come along — all are welcome! 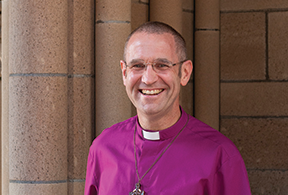 The Right Reverend John Roundhill was ordained a Deacon in 1993 and a Priest in 1994 and has vast experience in parish, school and international ministry, having worked in a parish in England, as a school chaplain in Scotland, and as Sub-Dean of St John’s Cathedral in Hong Kong. Bishop Roundhill has returned to Queensland to be appointed as Bishop of the Southern Region in 2018, after working in the regional Diocese of Bendigo as Dean of St Paul’s Cathedral since 2012. Prior to this he served in Brisbane as Rector of Aspley-Albany Creek, and as an Area Dean and then Archdeacon. Bishop Roundhill has a keen interest in social justice, and is committed to the mission of God and in seeing that mission expressed in contemporary ways. « Kammerphilarmonie Koin Orchestra at our Church!